State Rep. Devin Carney proudly represents the 23rd General Assembly District, which includes Lyme, Old Lyme, Old Saybrook and Westbrook. He was elected to his third two-year term in November 2018. 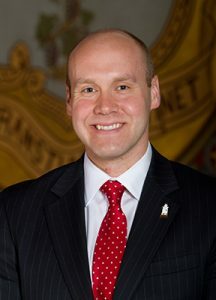 Carney is a member of Legislative Management and serves as Assistant House Republican Leader, which provides for a stronger voice at the legislative bargaining table and gives him leadership responsibilities on the House Floor during floor debate. Carney will return to the legislature’s Finance, Revenue and Bonding Committee where he will serve as the Ranking Member of the Transportation Bonding Subcommittee, which oversees state bonding for transportation projects. Carney will also return as a member on the Transportation Committee, where he previously served as Ranking Member. New this term, Carney will be a member of the Planning and Development Committee which oversees matters relating to local governments, housing, regional planning, conservation, and economic development. He was also named to the House Republican Screening Committee, a select committee that reviews all legislation. As a life-long resident of the 23rd, he knows first-hand what is important to the residents of this district. Having gone through the Old Saybrook public school system from kindergarten through high school, he knows just how vital the success of our children is as well as the quality of education they receive. Carney graduated from Brandeis University in 2006 where he received a BA in Political Science and a BA in American Studies with a minor in Film. After graduating college, he returned to his hometown of Old Saybrook. Like most college graduates bogged down by student loans, Carney worked part-time jobs at local small businesses, to help alleviate the college debt he incurred. Working on the front lines of a small business provided Carney with a strong foundation to later start his own small business in voiceover production and as a Realtor® with Coldwell Banker. Carney is an active member of the community where he has served as: Lector at Grace Episcopal Church in Old Saybrook, board member and Emcee for the annual Academy Awards Night at The Kate, member of the Old Saybrook Players, member of ASPCA, and is very active with both the Old Saybrook and Lyme/Old Lyme Chambers of Commerce. The various aspects of life, business and community that Carney experienced in Connecticut have given him the means to fully relate to his constituents. The 23rd district is deeply rooted in both his past and present; he is fully vested in this community and will seek to represent these communities with distinction as their voice in Hartford.